Illinois requires 16 hours of firearms training to obtain a Concealed Carry License. 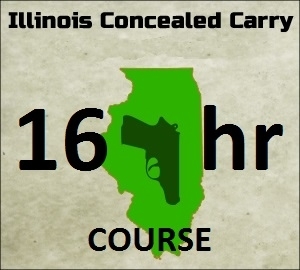 Our 16 hour Concealed Carry Course meets and exceeds the stipulations set forth by Illinois law. Students of all skill levels are welcome. Basic knowledge of firearms and their usage are covered during the first day of the course. State and federal law, use of deadly force, and hands on drills and range qualification are covered on day two. Each student will earn an NRA Basic Pistol and an IL State Police CCL certificate after successful completion of the course.